(Jakarta, 30 October 2015) Social media usage among Indonesian ISIS supporters is not necessarily changing patterns of recruitment but it is ensuring that ISIS propaganda is reaching new audiences. The government will not be able to develop effective counter-measures unless it puts more resources into training skilled personnel to analyse the content of extremist communications. Online Activism And Social Media Usage Among Indonesian Extremists, the latest report from the Institute for Policy Analysis of Conflict (IPAC), looks at how Indonesian extremists use Facebook, Twitter and various mobile phone applications like WhatsApp and Telegram. It divides Indonesian extremism from 2002 to the present into four periods and looks at how each period has been characterised by new communications technologies. Nevertheless, the propaganda seems to be having an impact, particularly the depictions of daily life in the Islamic State and the camaraderie of Indonesian fighters, smiling broadly with their new weapons or enjoying a dip in a hotel swimming pool after battle. More and more Indonesians have gone to Syria as families or even extended families, and in some cases, women have driven the departures. Indonesian government statistics on “foreign fighters” include women and children, who may constitute more than 40 per cent of the Indonesians with ISIS. They form an even bigger percentage of the deportees from Turkey. The proliferation of ISIS propaganda via individual Twitter accounts has raised concerns about the possibility of “lone wolf” attacks, although the report points out that such attacks are extremely rare in Indonesia. Since 2002, there have been only two, which injured only the would-be attackers. Some members of extremist chat groups have tried to whip up enthusiasm for such attacks but so far without success. 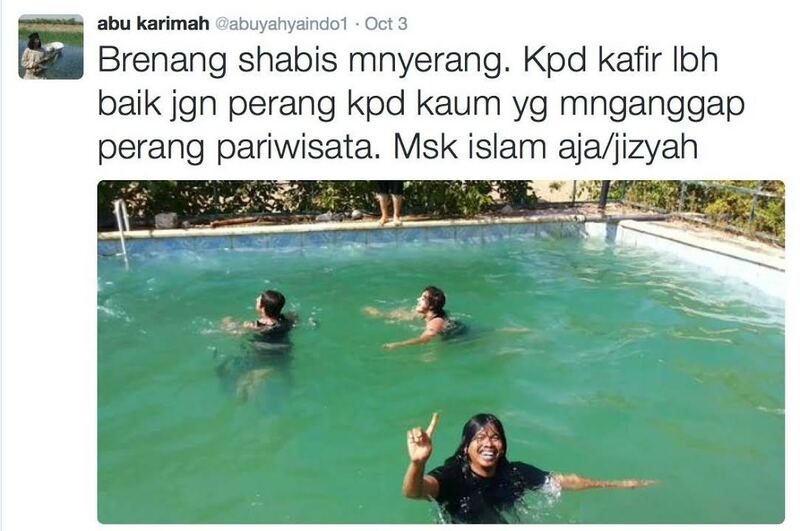 Thus far, Indonesian extremists have not been very creative in their use of the Internet. Despite exhortations to wage jihad through hacking, for example, there has only been only one major hacking success in Indonesia, an online embezzlement from a currency trading site, and that was almost five years ago. Perhaps the most interesting new use of smart phones has been marriage-by-video, uniting women in Indonesia or working abroad as domestics with Indonesian extremists in prison, in Syria or in radical groups. These marriages are used for a variety of purposes: to cement alliances, reinforce social hierarchies, satisfy the “biological needs” of prisoners, or bring women out to the Middle East for unmarried fighters.